Ah now I remember why I didn't like this movie as a child. 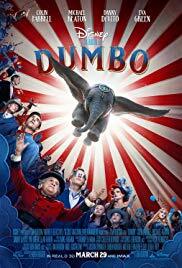 Not really a children's movie and not really an adult's movie, Dumbo is basically a film about how humans are garbage. "You know what would be a good film! Let's steal a baby elephant away from its mama and force it to work in exploitative conditions to "win" back the opportunity to see Mum again." It's bleak, kinda slow and I've never heard so many restless kids at a family screening before. Not to mention certain things just don't make sense: Dumbo is literally part of a circus with a freak show and they make fun of his large ears when there's a bearded lady, strong man and mermaid in the troupe? Yes, it's gorgeous, but what Tim Burton movie isn't?